Centre for the Remote Sensing was established in 1980 with the commencement of the Swiss/Sri Lanka Satellite Remote Sensing Project. 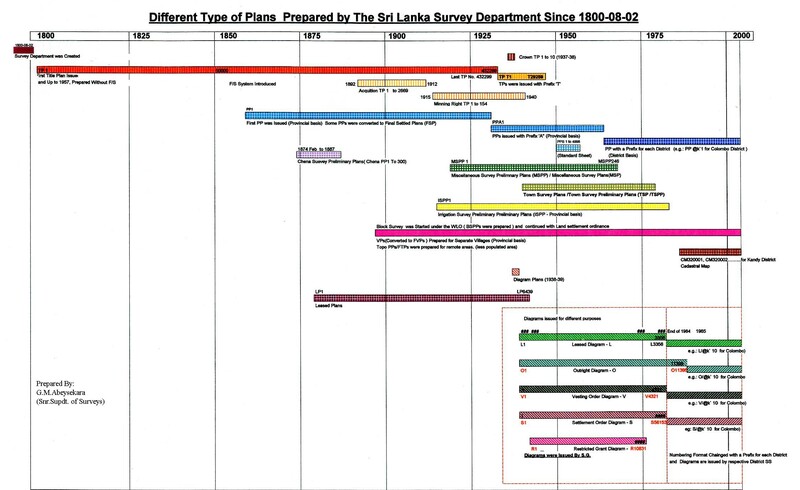 Satellite Remote Sensing was introduced to Sri Lanka Survey Department in late 1970’s. The Sri Lanka Centre for Remote Sensing of the Survey Department is the focal point of the Satellite Remote Sensing under the UN-ESCAP since 1996. Purchasing, Processing and storage of good quality satellite images using local funds. Those data been used for updating topographic databases. Data extraction from ALOS and high resolution satellites for 1: 50,000 new topographic database. Interpretation of aerial photographs and satellite images for special purposes other than the 1:50,000 Topographical mapping. Produced 1:100,000 landuse maps for the entire country using Aerial Photographs. Create GIS for Bulathsinhala and Weeraketiya Divisional Secretariats in 1998 under the Sri Lanka Swiss Planning Support Project. Produced 1:50,000 landuse maps for 37 sheets out of 92 using Aerial Photographs. 1:10,000 Topographical maps for the Tsunami effected areas under the Spatial Information Infrastructure For Reconstruction Monitoring Project SIIRM Project (2008-2009)using high resolution satellite images. Prepared new road network of Sri Lanka using high resolution satellite data and graded according to the RDA specifications in 2012. Prepared Landuse Data for whole courage of years 2000, 2005, 2010 & 2015 using Landsat images under UNREDD project in the period of 2015-2016. The Center for Remote Sensing was given the task of data extraction using ALOS satellite images to produce 1:50,000 Topographical data base. ALOS data is having 2.5m and 10m resolution in PRISM and AVNIR images respectively. This data set has been updated using QUICK BIRD (QB) high resolution (0.6m) satellite data. Priority is given to the northern area as there are no latest maps available due to bad situation there in the past. ALOS & QB satellite data have been geometrically corrected by the Centre for Remote Sensing itself with the help of GEOVIEW software. 70% of the sheets have been completed and scheduled to complete the island coverage by end of 2018. Purchasing of ALOS/QUICK BIRD (or any other high resolution images for every 5 years for updating of 1:50,000 digital data base). To have a close relationship with remote sensing users for sharing knowledge & conducting training programme for various remote sensing users. Do special type of applications by using high resolution satellite data for predicting & decision making, especially for the following fields.